Since its introduction at SHOT 2014 as the world’s first three field-of-view optical weapon sight, Raytheon ELCAN’s Specter® TR 1-3-9x Tri-FOV continues to gain traction among military users and sportsmen alike. As the name implies, the Specter® TR 1-3-9x optical weapon sight is a multi-field of view optic that offers discrete magnifications of 1X, 3X, and 9X in a single sight. Switching between the magnifications is quick and easy. There is a simple selector knob on the optic that lets you smoothly select between all three magnifications, with the reticle remaining illuminated at each level in the first focal plane. The 1X mode provides a true red dot with a 16° viewing angle and extended eye relief for extremely fast, “both eyes open” target acquisition. A traditional illuminated reticle is displayed when switching to the 3x mid-range and 9x long-range modes. The 3x magnification provides a 6° field–of-view, range-compensating reticle, and precision marksmanship capability for mid-range engagements. In 9X mode, a crystal clear 2° viewing angle provides unmatched long-range target detection, identification, and engagement capability. The Specter® TR Tri-FOV weapon sight is available in both 5.56 and 7.62 configurations. 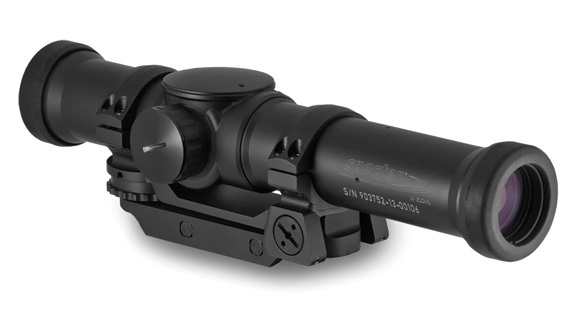 Like all Specter® sights by ELCAN®, the 1-3-9x incorporates crystal clear, quality optics, is rugged, battle-tested, and designed for durability and ease of use. The Specter® TR optical weapon sight was conceived in response to the U.S. Army’s need for a sight that would make the carbine more effective from close quarter battle to long-range precision fire, without the drawbacks of traditional “zoom through” scopes. Under stressful battlefield conditions, the fixed incremental magnifications of the Specter® TR weapon sight are much faster and easier to “click through” and the Tri-FOV configuration avoids selecting magnifications not intended by the operator. The design has proven to be very beneficial in situations where operators need to rapidly switch from identifying to engaging targets out to 1,000 meters. Raytheon ELCAN has been making advanced sighting systems since 1986 and is committed to ongoing product development to meet specific customer needs and changing operational requirements.